Carbohydrate-rich foods lead to the formation of blood sugars after digestion (e.g., glucose, fructose), which are then used by the liver to synthesize liver glycogen. Liver glycogen is essentially liver-stored sugar, which is in turn used to meet the glucose needs of the human brain – about 5 g/h for the average person. When one thinks of the carbohydrate content of foods, there are two measures that often come to mind: the glycemic index and the glycemic load. Of these two, the first, the glycemic index, tends to get a lot more attention. Some would argue that the glycemic load is a lot more important, and that rice, as consumed in Asia, may provide a good illustration of that importance. A 100-g portion of cooked rice will typically deliver 28 g of carbohydrates, with zero fiber, and 3 g of protein. By comparison, a 100-g portion of white Italian bread will contain 54 g of carbohydrates, with 4 g of fiber, and 10 g of protein – the latter in the form of gluten. A 100-g portion of baked white potato will have 21 g of carbohydrates, with 2 g of fiber, and 2 g of protein. As you can see above, the amount of carbohydrate per gram in white rice is about half that of white bread. One of the reasons is that the water content in rice, as usually consumed, is comparable to that in fruits. Not surprisingly, rice’s glycemic load is 15 (medium), which is half the glycemic load of 30 (high) of white Italian bread. These refer to 100-g portions. The glycemic load of 100 g of baked white potato is 10 (low). The glycemic load of a portion of food allows for the estimation of how much that portion of food raises a person's blood glucose level; with one unit of glycemic load being equivalent to the blood glucose effect of consumption of one gram of glucose. Two common denominators between hunter-gatherer groups that consume a lot of carbohydrates and Asian populations that also consume a lot of carbohydrates are that: (a) their carbohydrate consumption apparently has no negative health effects; and (b) they consume carbohydrates from relatively low glycemic load sources. The carbohydrate-rich foods consumed by hunter-gatherers are predominantly fruits and starchy tubers. 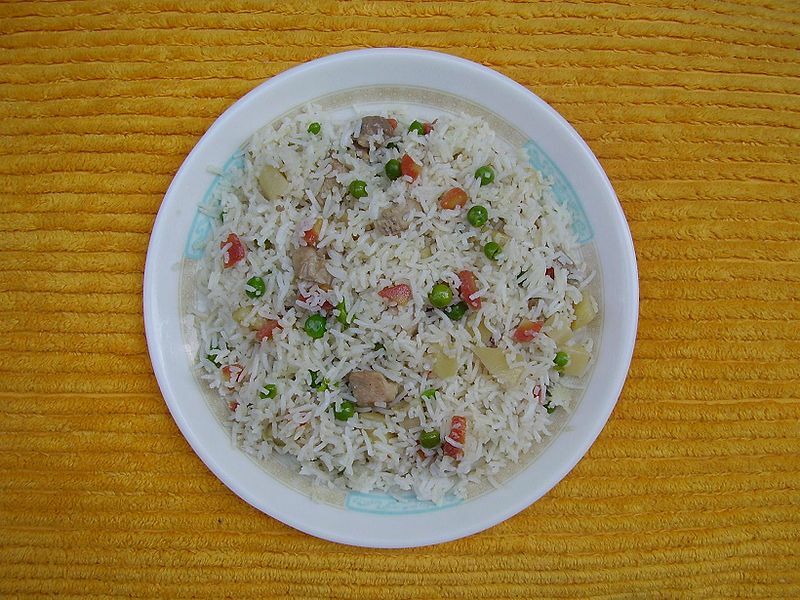 For various Asian populations, it is predominantly white rice. As noted above, the water content of white rice, as usually consumed by Asian populations, is comparable to that of fruits. It also happens to be similar to that of cooked starchy tubers. An analysis of the China Study II dataset, previously discussed here, suggests that widespread replacement of rice with wheat flour may have been a major source of problems in China during the 1980s and beyond (). Even though rice is an industrialized seed-based food, the difference between its glycemic load and those of most industrialized carbohydrate-rich foods is large (). 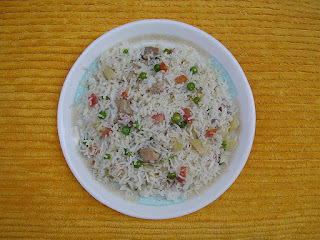 This applies to rice as usually consumed – as a vehicle for moisture or sauces that would otherwise remain on the plate. White rice combines this utilitarian purpose with a very low anti-nutrient content. It is often said that white rice’s nutrient content is very low, but this problem can be easily overcome – a topic for the next post. In a previous post () I used WarpPLS () to analyze the model below, using data reported in a recent study looking at the relationship between red meat consumption and mortality. The model below shows the different paths through which smoking influences mortality, highlighted in red. The study was not about smoking, but data was collected on that variable; hence this post. When one builds a model like the one above, and tests it with empirical data, the person does something similar to what a physicist would do. The model is a graphical representation of a complex equation, which embodies the beliefs of the modeler. WarpPLS builds the complex equation automatically for the user, who would otherwise have to write it down using mathematical symbols. The results yielded by the complex equation, partly in the form of coefficients of association for direct relationships (the betas next to the arrows), have a meaning. Some may look odd, and require novel interpretations, much in the same way that odd results from an equation describing planetary motions may have led to the development of the theory of black holes. Nothing is actually "proven" by the results. They are part of the long and painstaking process we call "research". To advance new knowledge, one needs a lot more than a single study. Darwin's theory of evolution is still being tested. Based on various tests and partial refutations, it has itself evolved a great deal since its original formulation. One set of results that are generated based on the model above by WarpPLS, in addition to coefficients for direct relationships, are coefficients of association called "total effects". They aggregate all of the effects, via multiple paths, between each pair of variables. Below is a table of total effects, with the total effects of smoking on diabetes incidence and overall mortality highlighted in red. As you can see, the total effects of smoking on diabetes incidence and overall mortality are negative, but small enough to be considered insignificant. This is interesting, because smoking is definitely not health-promoting. Among hunter-gatherers, who often smoke tobacco, it increases the incidence of various types of cancer (). And it may be at the source of many of the health problems suggested by analyses on the China Study II data (). So what are these results telling us? They tell us that smoking has an intermediate protective effect, very likely associated with its anorexic effect. Smoking is an appetite suppressor. Its total effect on food intake is negative, and strong. As we can see from the table of total effects, just below the two numbers highlighted in red, the total effect of smoking on food intake is -0.356. Still, it looks like smoking is nearly as bad as overeating to the point of becoming obese (), in terms of its overall effect on health. Otherwise we would see a positive total effect on overall mortality of comparable strength to the negative total effect on food intake. Smoking may make one eat less, but it ends up hastening one’s demise through different paths.